Location: Cross Ranch State Park and Nature Preserve. Cross Ranch State Park is located 12 miles southeast of Hensler via paved roads, or 6 miles by gravel. For paved access roads follow the brown park directional signs located on Hwy. 200 or Hwy. 25. 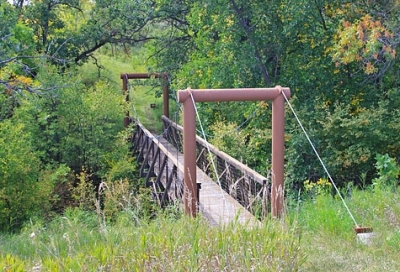 Opened in 1989, this 15-mile trail system is the result of a partnership between the North Dakota Parks and Recreation Department and The Nature Conservancy. 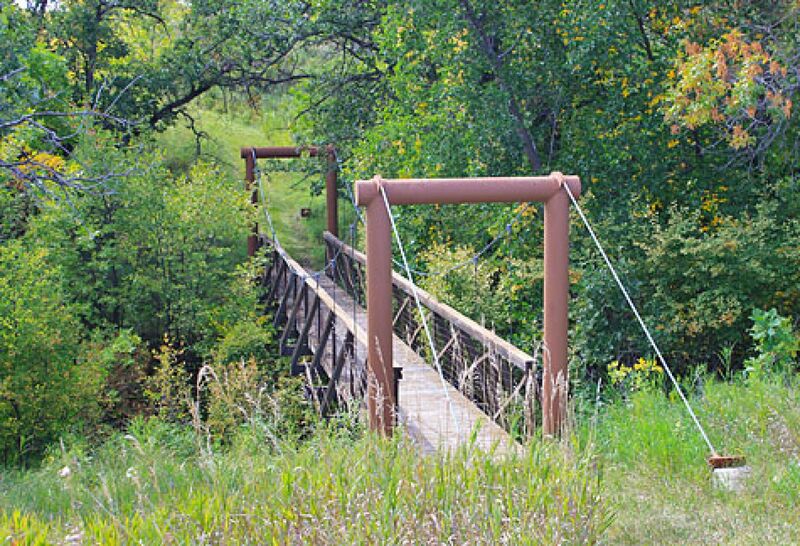 Here visitors travel through a diverse landscape sculpted by the Missouri river at the heart of the Lewis and Clark National Historic Trail. The trail system is a series of interconnected loops which run along nearly 1,500 acres of floodplain woodland on this free-flowing stretch of the Missouri before moving onto high bluffs overlooking the river. The cottonwood-ash woodlands and mixed grass prairie provide many wildlife viewing opportunities, including the chance to see bald eagles, the endangered least tern, and the threatened piping plover. 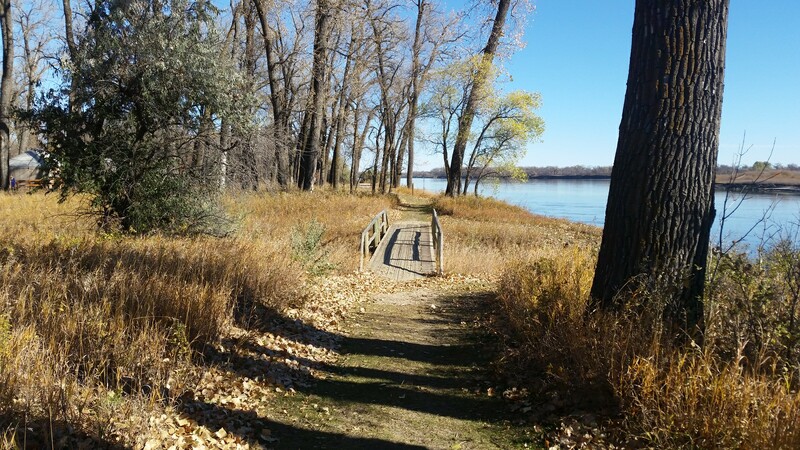 Lewis and Clark enthusiasts have the chance to see the Missouri river and its cottonwood river bottoms much as Lewis and Clark saw them. A number of ancient Indian village sites can also be found in the vicinity of the trail. Interpretive signs and a self-guided nature trail provide interpretation on these natural, historic, and cultural resources. 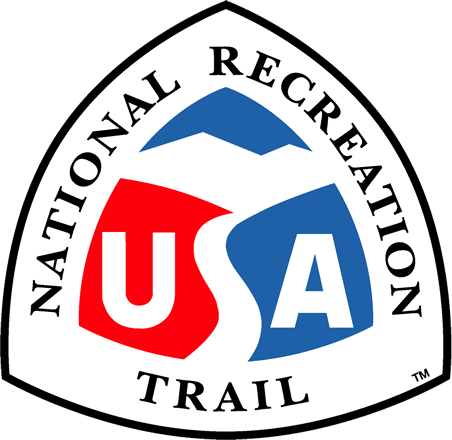 In addition to hiking, the trail is heavily used by cross-country skiers from the nearby communities of Washburn, Center, and Bismarck, who enjoy the 10 miles of groomed trail. At all times of the year, trail users also enjoy staying overnight at Cross Ranch in our rustic cabins, campgrounds, or backcountry campsites. Matah River Trail. Photo by Wendy Schmeichel. Trails are very well maintained. Most trails do loop or you can make them loop. Great place for a nice relaxing hike. Pretty flat which makes for easy hiking.